In preparing for the gin tasting this summer, I was stumped as to how I would prepare 30+ different variations and still focus on the tasting (and the party). And I had an inspiration – plastic squeeze bottles. They’re <$1 at your local restaurant supply store, and I could pre-make all the mixes. Needless to say, we returned all but one case. And as an equipment note, a half-dozen of these bottles is one key to an efficient home bar. I use them for primarily for simple syrup, grenadine, and fresh fruit juices. They are dishwasher safe and easily labeled with a Sharpie. A good drink — and I don’t care if we’re talking about a gin martini or a vodka/cran — needs to have balance. It can’t be too sweet, too tart, or too ‘hot’. The mixers, both in type and proportion, should match the base liquor being used, and any garnish should add to the taste of the drink as well as the look. That balance extends to the sweetener used, which is our topic for today. Simple syrup is a mainstay of any bar. Some drinks get all their sweetness from the juice or mixer used (like oj or cola or ginger ale). But some mixtures are only possible if you add the precise amount of sugar separately from the rest of the mixers. That’s where simple syrup comes in. Combine in small sauce pan and bring to boil with lid on. Remove lid, stir one last time and let boil for 30-60 seconds. Remove from heat and pour into plastic squeeze bottle. NOTE: the corn syrup is optional, but does help keep the syrup from crystallizing as quickly. Have you ever pulled out a cocktail book and seen a recipe that calls for 1 tsp of sugar? And no matter how much you shook that drink it was still gritty? I have the cure for you. I made a 2:1 simple syrup, which requires a little cooking/prep time but keeps for weeks at a time in a plastic squeeze bottle (see above). Some people will make a 1:1 syrup because it is easier. But 1:1 SS is still slightly gritty and also introduces a lot more liquid than needed into your drinks. Not a big deal for a mojito. But to make a well-balanced daiquiri you need condensed simple syrup. RECIPE TRANSLATIONS: 1 tsp sugar = 1/6 oz of my simple syrup and 1 T = 1/2 oz. And I know I preach being precise here, but estimating 1/4 oz of simple syrup in a recipe is usually close enough. And you’ll see in my recipes that I stick with 1/4 oz increments. Grenadine is supposed to be pomegranate-flavored simple syrup. 99% of the grenadine on store shelves, though (you know who you are, Rose’s) is red simple syrup with some citric acid and food coloring added. It is hard to believe that adding food coloring to sugar could make something that tastes worse than simple syrup, but in this case it does. Don’t believe me? Make some simple syrup and taste them head-to-head. The best solution is to spend some money on real grenadine. There are several boutique grenadine producers out there (like Sonoma Syrups) and these syrups are amazing. There are a lot of areas where you can save money in your home bar (bar-ware, base liquors) but this is an area where spending a few extra dollars really makes a considerable difference. Combine in shaker and shake well (>30 sec). Strain over fresh ice in a rocks glass and garnish with a maraschino cherry. You can top this drink with a little club soda to make it less strong. Or you can serve it ‘up’ in a chilled cocktail glass. 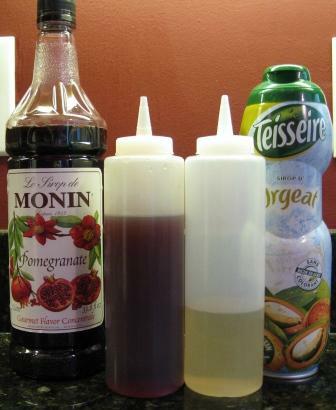 A less expensive solution (and one I often employ at home) that still produces a much better grenadine that the standard: purchase a pomegranate syrup from Monin or Torani and mix 2 parts simple syrup to 1 part flavored syrup. These syrups are pretty tart on their own, but do have strong fruit/pomegranate flavor. By diluting them a little you can make a very decent grenadine. Experiment with the ratios till you get something you like. And in the end these are less expensive than the Rose’s we all know and hate. Lastly, if you’re in a pinch and only have Rose’s grenadine: only add half the called-for amount, and fill the other half with simple syrup. That at least will temper the harsh chemical flavor of the Rose’s in your favorite cocktail (like a Tequila Daisy). There are so many different flavors and possibilities out there, you could fill a whole cupboard of your bar with syrups. I have quite a few as I have experimented with different flavors, but there are 3 that I use with any regularity. And only 2 of those that I would recommend to readers of this blog. Orgeat (pronounced or-ZHAH) is an almond flavored syrup from France. They mix it with orange juice for a breakfast drink, and it is critical to a successful Mai Tai. I also make an Orgeat Fizz with it for kids or teetotalers. I love a brand called Tesseire, but it is getting harder to come by in the U.S. The Monin Orgeat is a good substitute, though. Passion Fruit Syrup (I have Torani’s in my cupboard) is a requirement for a decent Hurricane. I don’t use it for much else, but there literally is no way to make a palatable Hurricane without it. So find the smallest bottle you can and it’ll last you years anyway. Lastly, there has been a ginger renaissance lately in the cocktail world. So I keep a bottle of Monin Ginger Syrup in my bar as well. Admittedly, though, these are pretty specialty drinks and even I don’t use it that often. So I wouldn’t recommend it for a standard home bar, unless you find a drink you especially like. And as with the Pomegranate Syrup, I mix my ginger syrup 1:2 with my simple syrup recipe to make it less tart. Having been passionate about cocktail craft for many years, I've recently been coerced into sharing my insights and experiences. This blog is my first attempt at that goal. This entry was posted in Uncategorized and tagged Club Soda, grenadine, Lime Juice, Orgeat, Simple Syrup, Tequila, Tequila Daisy. Bookmark the permalink. One quick addition to this post: I recently came across Stirrings brand grenadine in a local premium grocery store. I’ve tried this one before, and it is much more widely available than Sonoma Syrups or even Monin (mostly available through wholesale channels). It is 300% better than Rose’s. And if it is available in your local grocery store it typically isn’t terribly expensive or hard to get. It still falls significantly short of Sonoma or my Monin creation. But for less money and less work it is a suitable substitute. In general I would say it is thinner and more tart than my other options but does make a decent Daisy. How did you make the orgeat fizz again? That should be pretty close, and you can have fun experimenting with the ratios.